¿CUÁNDO SE HACEN LOS TOUR? LOS TOUR SE LLEVAN ACABO ACORDE A LA AGENDA SEMANAL. USTED DEBE CONSULTAR EL ESTADO DEL TOUR Y LA PROGRAMACIÓN. ¿QUÉ SIGNIFICA ESTE MENSAJE: “THE DATE IS NOT ON THE AGENDA”? LA INFORMACIÓN DEL TOUR PARA LA FECHA NO ESTÁ DISPONIBLE TODAVÍA. ¿SON NECESARIAS LAS RESERVAS PARA HACER LOS TOUR? SI, LAS RESERVAS SON NECESARIAS PARA OBTENER EMAIL DE NOTIFICACIÓN Y POSTERIORMENTE LA CONFIRMACIÓN. RESERVAS SUJETAS A DISPONIBILIDAD Y SE REALIZAN EN EL FORMULARIO DE NUESTRO SITIO WEB. ¿CÓMO SÉ SI MI SOLICITUD DE RESERVA ESTA CONFIRMADA? ¿CÓMO PUEDO CANCELAR MI SOLICITUD DE RESERVA? USTED PUEDE HACERLO INGRESANDO EL ID DE LA SOLICITUD DE RESERVA EN EL FORMULARIO STATUS DE NUESTRO SITIO WEB. ADEMÁS USTED PUEDE CONSULTAR EL ESTADO DEL TOUR EN EL MISMO FORMULARIO. APROXIMADAMENTE 2 HORAS DE DURACIÓN. ¿ES POSIBLE HACER DOS TOUR EN UN DÍA? SI, USTED PUEDE HACER UN TOUR EN LA MAÑANA Y OTRO TOUR POR LA TARDE. ¿HAY UN NÚMERO MÁXIMO DE PERSONAS PERMITIDAS EN UN TOUR? SI, POR LO QUE ES NECESARIO HACER LA RESERVACIÓN PARA QUE PODAMOS ESTAR SEGUROS DE CONTAR PARA LA FECHA CON LOS GUÍAS ADECUADOS EN EL PUNTO DE PARTIDA. ¿SON ACCESIBLES LAS SILLAS DE RUEDA DURANTE LOS TOURS ? TODOS LOS TOURS INCLUYEN ALGUNAS PENDIENTES Y TERRENOS IRREGULARES, Y DURAN POR LO MENOS 2 HORAS. A PESAR DE ESTO, TODOS SON MANEJABLES EN SILLA DE RUEDA, SIEMPRE Y CUANDO VAYA ACOMPAÑADO POR ALGUIEN QUE LE PUEDA AYUDAR. ¿CON QUÉ TIEMPO DE ANTELACIÓN DEBO PRESENTARME PARA EL TOUR? ES PREFERIBLE QUE LLEGUE POR LO MENOS 15 MINUTOS ANTES DEL INICIO DEL TOUR. ¿EL TOUR INCLUYE LA ENTRADA A LOS SITIOS DE INTERÉS? **** FREE TOUR CARTAGENA NO SE HACE RESPONSABLE DE ACCIDENTES, PÉRDIDAS, ROBOS U OTRO TIPO DE IMPREVISTOS QUE PUEDAN OCURRIR DURANTE LAS VISITAS GUIADAS. **** NUESTROS GUÍAS SE RESERVAN EL DERECHO DE ADMISIÓN A LOS TOURS A CUALQUIER PERSONA SI LO CONSIDERAN NECESARIO. **** LOS TOURS TIENEN RECOMENDACIONES Y ESPECIFICACIONES. 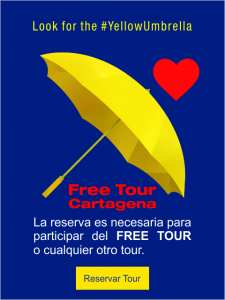 FREE TOUR CARTAGENA NO SE HACE RESPONSABLE EN CASO DE NO SEGUIR LAS MISMAS.